For a Citadel graduate, the band of brotherhood formed and embedded in the course of four long years is both figurative and literal. It is intrinsic and personal as well as concrete and visible. What is known to many as “the band of gold”, The Citadel ring is instantly recognizable and marks its wearer as a Citadel Man, or since 1999, Woman. It is standardized yet unique, and it is distinguishable from all other college rings. There are no others like it, and, as far as Citadel alumni are concerned, there will never be. Pat Conroy, Class of 1967, immortalized the sentence “I wear the ring.” in his novel The Lords of Discipline published in 1980. The book was made into a film released in 1983, and I entered the college as a freshman “knob” in August 1985. I had watched the movie before arriving on campus, but I had not read the book. Although everyone had recommended it as a must read, I had not wanted to distort my mental picture of The Citadel, or worse, scare myself into thinking I had made a very bad decision. I should not have wasted energy on such trivial contemplations. The cadre quickly provided to me its own picture of life at The Citadel. I was confronted with a stark reality – knob year was not going to play out like in the movie. It was, at times, going to be much more terrifying, but, as the cadre would like to frame the experience for us, in a positive, character building kind of way. In the Fall of 1988 after having survived knob year and then another two academic years, I was, like the rest of my brothers of the class of 1989 and all the Citadel Men before us, eager and ready to receive my “band of gold”. For the young men at the college in the early 1940’s, the sentiments attached to the ring were no different; however, as they were preparing for war how they received their rings was very different. From the school’s archives, I learned that the sophomore class in the 1942-1943 academic year was given a ring with no numerals. “The Enlisted Reserve Corps [ERC] told us we would get to graduate, just not when,” says class  member Bob Adden. The classes of the early 1940’s gave their school and country so much. I have found something else they bestowed on the long gray line – the fact that it is possible to spot the ring from a mile away. A sentence of but four words – simple yet omniscient – when you wear the ring. 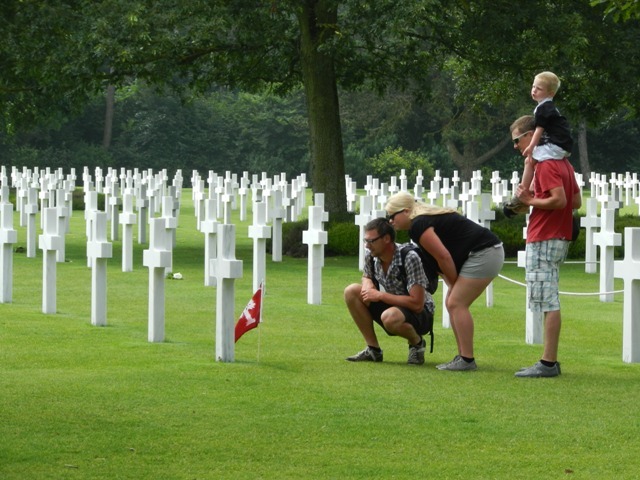 In fifteen WWII American Cemeteries of Europe and North Africa and two British Commonwealth cemeteries, 56 Citadel Men rest in peace or are remembered on the Tablets of the Missing. They, too, aspired to wear THE RING. We shall not forget them. Visitors to Normandy American Cemetery stop at the grave of Captain Clough Farrar Gee, III, U.S. Army Air Corps, Class of 1939. CPT Gee was killed in action on D-Day +1 while providing close air support to the Allies pushing inland from the Normandy beachhead. This entry was posted on April 12, 2012 by Roger Long. It was filed under The Citadel, The Citadel Ring and was tagged with Citadel Men, Class of 1944, College Rings, History, The Citadel, WWII. Once again the class of ’89 is leading the way. Thanks for being ‘my’ cadre corporals. A rerun of our most popular post. 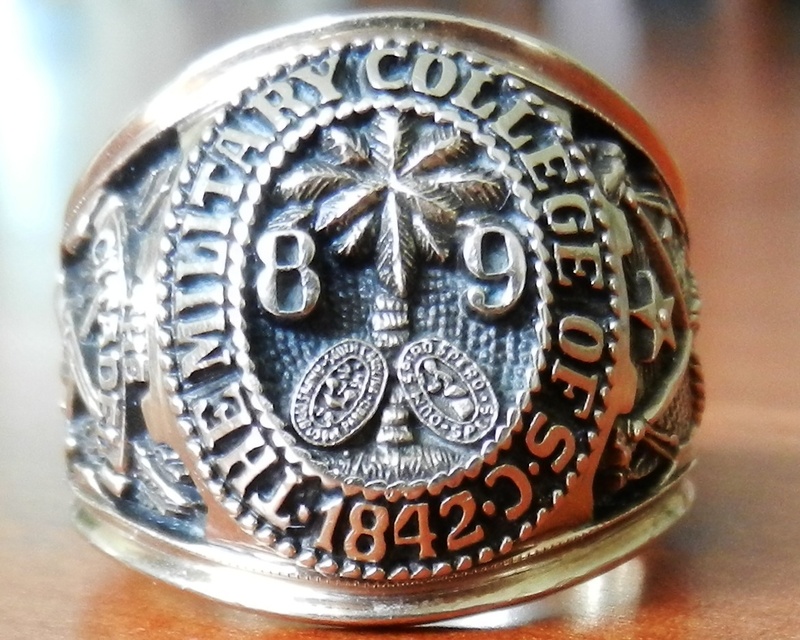 In honor of the Class of 2013 who receive The Ring today and for all the parents, alumni and family who will be visiting The Citadel this Parents’ Day Weekend. Class of 2013 uphold the ideals of The Citadel and never forget those who have gone before you.